The PHB-115 model has been discontinued. Please see the PHH-128 as a possible alternative or contact our Flow Engineering Department. The PHB-115 is a portable pH/mV meter of a metal construction and has a convenient carrying handle for portability. 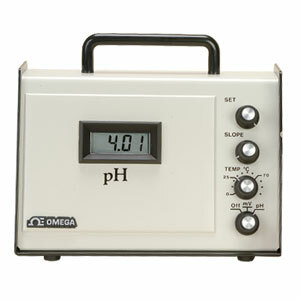 The PHB-115 covers the full 0-14 pH scale with a resolution of .01. The manual temperature compensation range is from 0 to 100°C. The ORP measurement range is -1999 to 1999 mV with a resolution of 2 mV. The PHB-115 can be used for a variety of applications such as water quality testing, wastewater, and laboratory use. pH Probe Dimensions: 1.3 cm ( 1 /2 ") Diameter, 13 cm (5") Long, 1.8 m (6') Cable. Please download PDF file for full specifications and a complete list of available models. 참고: Unit comes complete with pH electrode and complete operator’s manual.